My mate told me that I just don’t understand irony. Which was ironic because we were at a bus stop at the time. An onion just told me a joke. I don’t know whether to laugh or cry. I got chatting to a lumberjack in a pub. He seemed like a decent feller. Whether told in the rugby clubs of Wales or the gentlemen’s clubs of London, their sharpness and simplicity unites us all. Short, sweet and wickedly clever, they hold a special place in the annals of comedy, and as the rise of Twitter heralds a resurrection of the art form, there seems no better time to celebrate the immortal one-liner. 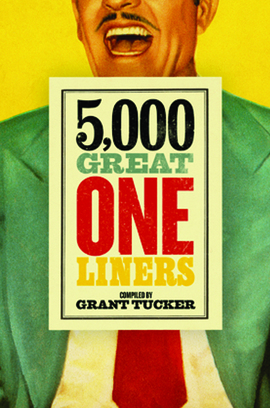 In this book, Times diary columnist Grant Tucker does just that, bringing together 5,000 of the funniest one-liners ever told in one definitive volume. Laugh-out-loud funny, 5,000 Great One-Liners has all the quips, zingers, puns and wisecracks you’ll ever need – and a whole lot more.